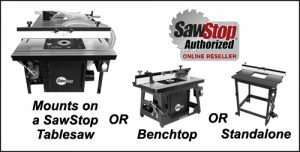 Congratulations to the winner of our 2018 SawStop Router Table Giveaway, Mike Ness from Riner, VA. Mike was able to choose between three different models of the SawStop Router Table, either the Standalone Router Table, the Benchtop Router Table, or the table that mounts on a pre-purchased SawStop Tablesaw. Mike chose the Standalone model, which he says will be a great addition to his shop. Also included with his win was a SawStop Router Lift and a SawStop Downdraft Dust Collection Box. Thank you to everyone who entered. Be sure to subscribe to our Highland Woodworking email list to receive notification of when our next contest begins! Share Your Woodworking and Get $50 Highland Credit October Poll: What kind of floor do you have in your shop?